*Canmore & Thanksgiving camps are separate. PAYMENT PLANS: Payment plans available for year-round programs. Minimum of $600 due at time of registration. The U18 & U20 Competitive Team (aka "Comp Team") offers a great team atmosphere and excellent coaching for the dedicated skier. The typical training season runs mid-May through early April, but we also offer options for summer-only training. *locations and activities vary. Coaches will send out weekly schedules. Summer: Tuesdays, Wednesdays, Thursdays, Saturdays, and Sundays 8 a.m. - 10 a.m.
Fall & Winter: usually Tues, Wed, Thurs, at 4:00 pm in town; Sat, Sun. mornings. Additional morning strength training sessions may also be scheduled. How much you travel and/or race is up to you. See the athlete development plan and your coach for suggestions. 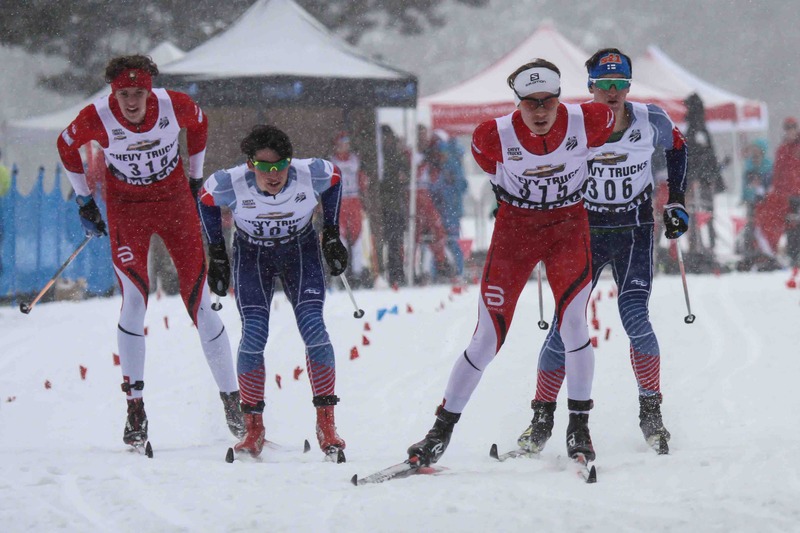 Skiers who participated in the U16 program can easily transition to the Comp Team. If you want to switch to skiing, or are thinking of coming back to skiing after a break, it's not too late to join! Talk to our coaches. We'll have one van to pick athletes up from the Bozeman High School. Please contact your coach for additional details. Locations vary. Your coach(es) will send out weekly training schedules on Mondays. Schedule change announcements are emailed as needed. Comp members are eligible for financial aid and scholarships. Applications are due in mid October each year. The Devo Comp team spends the non-ski-season months training--running, biking, roller skiing, hiking, playing games, and so on. This kind of dryland training throughout the year is what works best for skiers. However, we do understand that some athletes have other extra-curricular conflicts. We're flexible. Talk to your coach. You can still join us whenever your schedule allows. The Nordic Team holds an intra-club gear swap each October (before the big BSF Ski Swap at the Fairgrounds). This is a great time to source (and sell) used equipment among fellow teammates. Skiers should have both classic and skate skis and poles. For skate and classic specific gear, it is best to use the manufacturer's size charts, which correlate the skier's weight and height to ski length and stiffness. At the ski swap, BSF volunteers/coaches will be on hand with a flex-test board to help match your skier with the best skis available. Please take advantage of this opportunity—skis that are too stiff or too soft can make for a very frustrating skiing experience. When purchasing new equipment through a local retailer, they will provide similar testing. Ski poles for skate should reach between the skiers chin and "mustache area." Classic poles should reach between the armpit and the shoulder. On classic days, have a range of inexpensive kick waxes and a cork (local ski shops can recommend a few general kick waxes--blue, extra blue, purple, red--which can be kept in a baggie in your skier's bag. When you register for the program, you will be added to an email list. Your coaches will communicate weekly details to you through email, as well as any last-minute changes. (It’s important that you do not unsubscribe to BSF emails, as this is our main mode of communication.) If for some reason, you are not receiving emails from us, let us know! BSF is a traditional nonprofit, relying on donations and fundraisers to cover approximately 50% of our program costs. Volunteers donate thousands of hours each year. We couldn’t do it without you! We’re always looking for volunteers to help with our fundraisers, serve on committees, or help at Nordic, Alpine, and Freestyle/Freeskiing competitions. There’s a bigger picture to what BSF teaches skiers, when and why. BSF’s programs are consistent with the U.S. Ski & Snowboard Long-Term Athlete Development (LTAD) Systems. The emphasis on training becomes year round. Continue to use in complementary sports and activities for variety and to enhance conditioning. Implement periodized training with varying volumes and intensity. Athlete implements a periodized training program that places stress on the body and subsequent recovery time. Athlete uses low-intensity aerobic, high intensity aerobic and anaerobic training to improve race fitness. Athlete maintains a training log. Refine event specific technical and tactical skills to achieve desired outcome. Integrate the increased strength, power and body size to achieve more complex movements and precision of skill application. Seeks more challenging terrain. Reinforce the idea that hard work creates more opportunity for success. Accountability is important. Self-analysis and the acceptance of feedback is encouraged. Athletes analyze their own performance and identify areas for improvement. Enforce the concept that success is attributable to personal effort. 6-10 training sessions per week includes some two-a-day sessions. 7-12 sessions per week out of season. The emphasis on training is year round. Continue to use in complementary sports and activities for injury prevention, avoiding burnout, and to enhance conditioning. Use periodized training with varying volumes and intensity. All components of training are now periodized and individualized. Masters all techniques and develops personal style. Mastery of tactical strategies based on the athlete's strengths, discipline and goals. Athletes continue to have opportunities to experience success and the coach-athlete relationship is built on a mutual trust and respect. The coach-athlete relationship develops into a collaborative partnership with the athlete "self-coaching" and sharing feedback with coaches. Athletes refine their use of positive self-talk and imagery. Work towards mastery of more complicated techniques. Practice with distractions to challenge athletes. Identify the ideal performance state and implement strategies to achieve this state consistently. Work towards mastery of all aspects of preparing mentally for competition.